Globe Electric's Edison Collection is all about great design and simple minimalism. With exposed sockets and woven fabric cords, these pendants can transform your space into the super stylish and trendy home you've always wanted. These pendants work well alone or as a group - you can change them at any time to suit any mood. Buy a few that look the same or buy ones with different cord colours or socket finishes to create a multitude of different looks. You are going to have so much fun decorating with these. And let's not forget how different you can change the look of the pendant by simply changing the bulb. Add a vintage-type bulb to achieve a classic look or try out an oversized designer bulb - the bigger the better! ACCENT LIGHT: a perfect accent light for any space, this minimalist design is a versatile update for traditional and modern homes alike - add an oversized bulb for a super trendy look, the bigger the better! The TREY pendant features a decorative matte black finish. This contemporary piece features an open cage design with exposed light bulbs. This unique look speaks to the style of the homeowner. Ideal over a kitchen island, dining and living room. Pair it with Canarm's vintage bulbs (article # 819488) for the perfect look. Available in store and online! Edison 1-Light Matte Black Pendant Globe Electric's Edison Collection is all about great design and simple minimalism. With exposed sockets and woven fabric cords, these pendants can transform your space into the super stylish and trendy home you've always wanted. These pendants work well alone or as a group - you can change them at any time to suit any mood. Buy a few that look the same or buy ones with different cord colours or socket finishes to create a multitude of different looks. You are going to have so much fun decorating with these. And let's not forget how different you can change the look of the pendant by simply changing the bulb. Add a vintage-type bulb to achieve a classic look or try out an oversized designer bulb - the bigger the better! 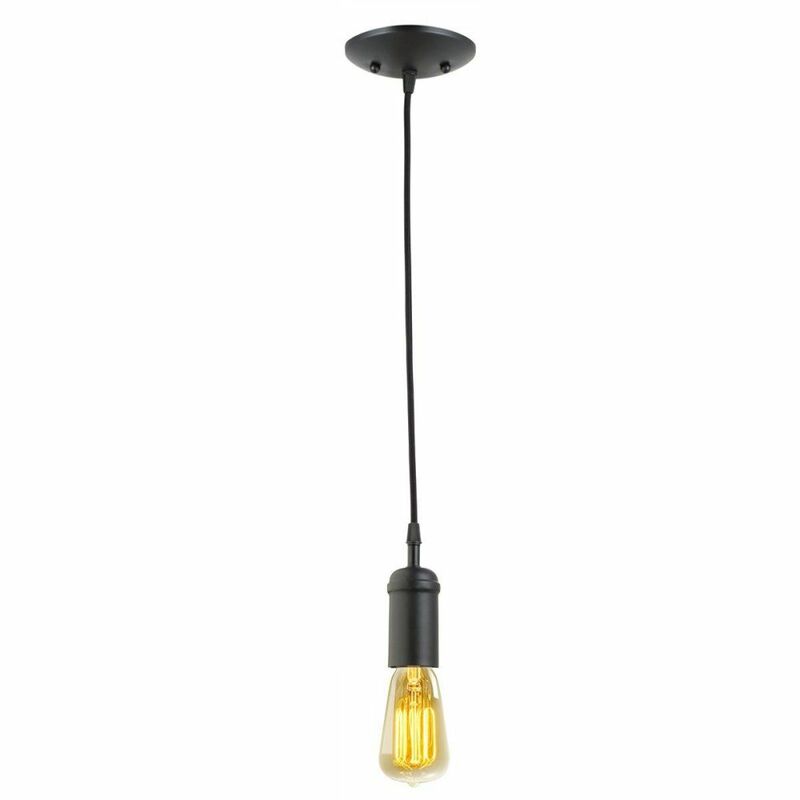 Edison 1-Light Matte Black Pendant is rated 4.6 out of 5 by 34. Rated 5 out of 5 by HomeDepotCustomer from The light is as I expected. The picture is accurate.... The light is as I expected. The picture is accurate. Rated 5 out of 5 by Christinepro from Great product! Very happy with the quality. A great addition to my home! Rated 5 out of 5 by RiverRanch from Nice and sturdy light - perfect for crafting and making... Nice and sturdy light - perfect for crafting and making your own hanging lights! Rated 2 out of 5 by JH from Can’t cut to length, as needed, without the fabric around... Can’t cut to length, as needed, without the fabric around the wire shrinking up strangely upon cutting it. Rated 5 out of 5 by Lulu from Great light and a great price! The woven covered cord makes it look authentic from the era of thi... Great light and a great price! The woven covered cord makes it look authentic from the era of this light represents. And yes, I can remember when a woven covered cord was the norm. If you are looking for a warm and welcoming look, then look no further. It is exactly as was described on the Home Depot site. I liked it so much that I bought 3 of them to hang close together in the same room, but at different lengths. I have my eye on a couple other Edison style light fixtures, one a multi caged pendant and one a cage flush mounted. Rated 5 out of 5 by Heather from Beautiful ! We bought 3 of these lights for our bath Reno. They hang over the vanity and add just the right touch. They light the room very well. I would definitely recommend them. Rated 4 out of 5 by Vin90 from Good rustic lighting Bought them to creat a rustic theme. They look great. I put the Edison bulbs in and they look really elegant, especially at night time when you get the full effect of the light. Would recommend I only gave them a 4 because the wire it hangs from were curled up in the box and it takes time to try and straighten them. Other than that I really like them. how long is the cord on this fixture...or what is total height from top to bottom not counting light bulb? How can you shorten the length of the cord? How long is the cord on this fixture? Can you attach a lamp shade to the model 64906 1 light vintage handing pendant light fixture with black rope. Also how long is the wire. I am hanging 5 of this on a cathedral ceiling which will have different heights around the room. Details above say no bulb included. What is the socket diameter? Does this have to be ceiling mounted or can it be hung on a hook? Does this light have an on/ off switch on the fixture directly, as does the same light from thei brand with the red cord? thanks! Also, can I attach a lamp shade to this light? thanks! This light does not have an on/off switch like the red one does. Also, you can attach a lamp shade if you'd like, but this was designed to be an open fixture.